Tom Veatch – Humor is Affective Absurdity. 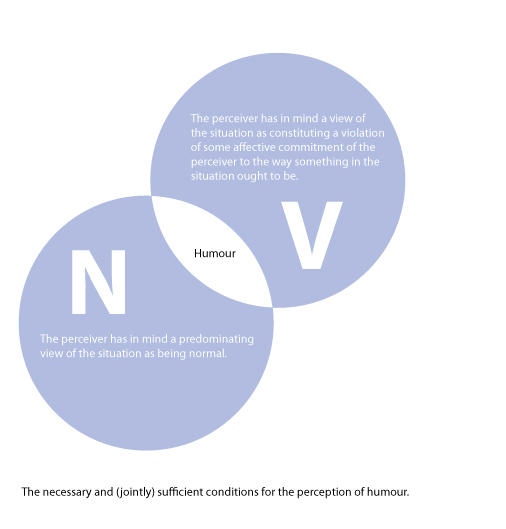 Tom Veatch’s interesting paper on a theory of humour proposes that humorous situations arise when an event/situation is simultaneously perceived as normal (N) and as a violation (V) of some affective commitment of the perceiver to the way something in the situation should be. If one of these factors three factors is not present then humour will not arise. I have tried to illustrate this with the above venn diagram. Veatch discusses morals and how everybody has a different moral code that will affect their interpretation of different situations. Moral codes vary from person to person, from country to country, from generation to generation and change dramatically throughout a persons lifetime. For the purposes of his theory Veatch describes morals as a persons interpretation of ‘what should be’ . The capacity for humour in a situation depends on how strongly a person feels about the violation of their moral principle. 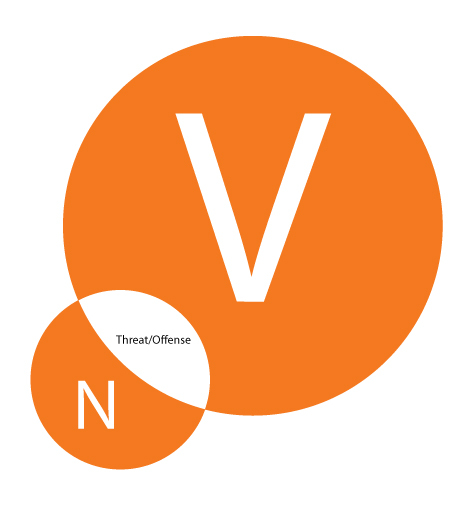 If the size of the violation (V) is proportionally far greater than the perception of normality (N) then it is likely to be perceived as not humorous but threatening or offensive. If however the person feels much less strongly about the perceived violation then it may be interpreted as non – humorous. In the following predictions, X, Y, and Z, may refer to different individuals, or to the same individual at different times. Prediction 1: If X finds a situation funny where some principle is violated, and Y instead finds it to be offensive, frightening, or threatening, then we should find that Y is more attached to the principle violated than X, not vice versa. Prediction 2: If on the other hand, some perceiver Z finds the aforementioned situation unremarkable, then we should find that Z has no personal moral attachment to principles violated; we should not find, for example, that Z is more attached to them than the X is who finds it funny. Detachment from a violation is another factor that will affect how funny a situation may be perceived. The intensity of a joke may be magnified if any of the components that make it up are increased. For example if there are more perceived violations or the principle violated is extremely relevant than the joke may be considered more funny. Or if the sense of normality is particularly relevant or gratifying then the same effect may apply. Veatch argues that humour can have both positive and negative psychological effects. By making a perceived violation ‘normal’ the attachment to the violated principle may be lessened but this may also work the other way around – if a normal situation is violated or it is perceived that the normal situation is being laughed at then it may become offensive. Order. Veatch suggests that most jokes follow an order of N + V, where a normal situation is revealed that the punchline violates. 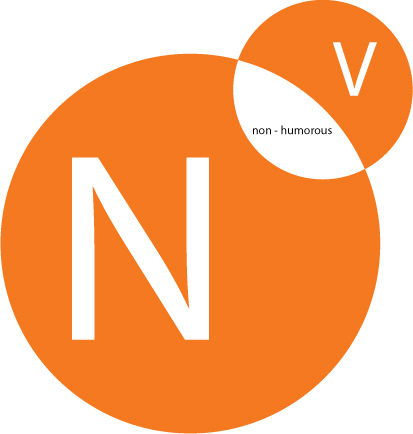 Although humorous situations may arise in either order N+V or V+N. If I go back to the ‘I keep thinking it Tuesday’ joke that I described in a previous post then it would appear to be V+N, a unusual and exotic scene is set (the swamp, hippopotami) then the punchline is so very normal that humour arises. Relief laughter occurs when something bad is presented (V) followed by something that is perceived as good (V+N). Likewise when we are suddenly presented by bad news there may be a moment of laughter through disbelief (N+V) before belief fastens and all humour is lost (V). This joke follows a very similar pattern to the ‘tuesday’ joke although the situation is more of a moral violation. Jesus dying on a cross is a violent and moralistic violation on many levels but the punchline that follows is equally mundane. This joke should work better if the levels of each element are increased without one becoming proportionally much bigger than the other. So by making the set up as elaborately strange or different from the norm (which must be as mundane as possible) gives the joke the best chance of succeeding. However with the jesus joke there would appear to be a large risk that the content would soon become too much of a violation and the joke would become offensive. This entry was posted in Uncategorized on November 19, 2011 by jonskibeat. I’m writing a paper on Peter McGraw’s popularization of Veatch’s ideas and wonder whether you were the one to create the venn diagrams in your post or if those came directly from something Veatch wrote. I’ve had a look at his paper and saw the description of what you’ve done, but not the venns themselves. If they are your creation, do you have an objection to me using them in an MFA Critical Paper? You’ll be cited of course! I did make those diagrams and you are very welcome to use them in your paper. I would love to read it when it is finished. If you need higher res files let me know and I will dig them out..